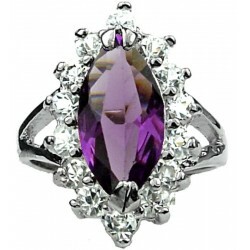 Fashion women costume solitaire cluster ring presents a purple marquise cut rhinestone in two prong claw setting, with a halo of clear diamantes surround the purple stone, set on silver plated split shank shoulder ring band. 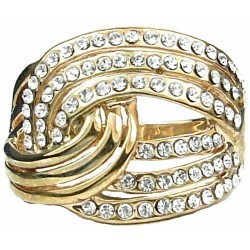 Love statement costume gold ring is entwined three pave clear diamante strands tuck round three polished finishing gold plated strands back to both side, to create tie the knot at centre, set into gold plated ring band. 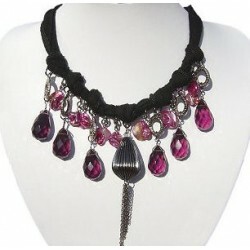 Purple teardrop bead bold statement cascade rope necklace cascades fuchsia mother of pearls, large purple faceted teardrop beads, silver hoops, antique silver plated metallised teardrop and tassel set on black ropes in chandelier style. 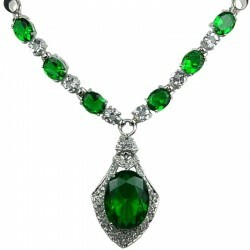 Emerald green oval rhinestone clear diamante rhombus drop necklace features clear diamantes surrounded a beautiful large facet-cut emerald green oval rhinestone claw setting on silver plated stylish pear-shaped rhombus drop pendant, is suspended on facet-cut clear round diamantes and emerald green oval rhinestones linked to silver plated solid oval chain. 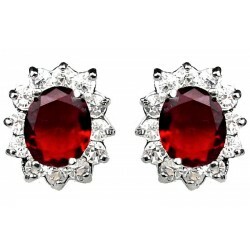 Classic women costume stud earrings present ruby red faceted cut oval rhinestone claw setting with a halo of cluster smaller clear diamantes surround the red stone into silver plated oval post earring studs. 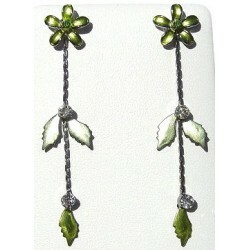 Green enamel flower post drop earrings dangle green and light green enamel leaves adorn with green rainbow and clear diamantes. 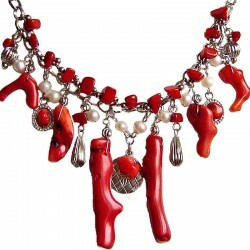 Red coral reef cascade statement necklace has silver plated chain, connecting to organic shaped red coral, coral tumblechips, white pearls, silver disc, silver teardrops and silver beads in cascade style. 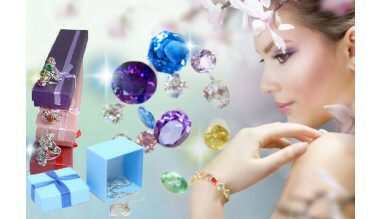 Aqua blue costume jewellery set combines matching teardrop necklace and medium drop earrings, features aqua blue faceted teardrop rhinestones and aqua blue diamantes, presents in gift box, dressy fashion wedding and party dress accessories for women. 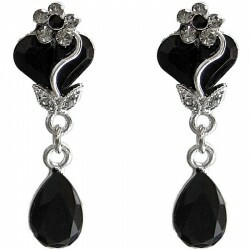 Black diamante flower heart teardrop dress drop earrings feature grey and black diamante flower and black diamante heart dangling black diamante teardrops. Lustrous and beauty white fashion pearl jewellery set with matching Y-shaped drop necklace, bracelet and earrings, features double row claw setting clear diamantes, studded at intervals with white pearls. Red dressy costume jewellery set combines matching teardrop necklace and short drop earrings, is paved with clear, red and burgundy diamante teardrops, presents in gift box, elegant style fashion dress accessoies for her, women and girls. Modern & elegant costume jewellery set with matching red necklace, bracelet and earrings, features ruby red oval rhinestones set at intervals with clear diamantes, mounted in silver plated claw setting articulated S-shaped links. 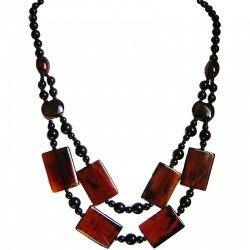 Reddish brown rectangle natural stone cascade long necklace composes of black beads and reddish brown Agate natural rectangle stones and beads to form natural stone double row long necklace. Brighten up your outfit with this dark pink Lily silver plated flower dangle necklace features dangling Lily flower detail at the centre, embellished with dark pink acrylic rhinestones, clear diamantes, dark pink teardrop pearls and pink beads. 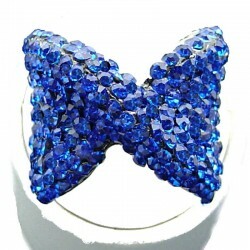 Royal blue diamante large bow fashion ring is topped with pave royal blue diamantes for sparkle effect, created bow-shaped royal blue enamel frame at detailed look to form the centrepiece, set prominently on silver plated adjustable band. 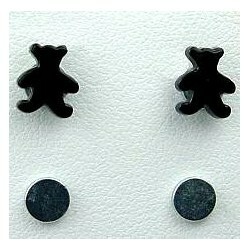 Cute, fun and lovely black teddy bear stud magnetic clip on earrings feature with teddy bear shape with black smooth finishing on non-pierced post magnetic clip-on earring studs. Catwalk delicate irregular shape necklace is crafted in seven gold plated irregular shaped flat circles, enhanced with red diamantes, red and burgundy shimmer enamel, set on gold plated chain. 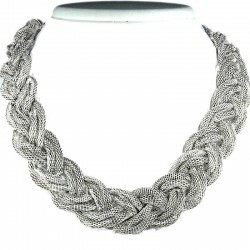 Silver multi-chain plaited chain necklace features multi-strand silver plated mesh chains braided together to create women's classy sophisticated and funky fashion style statement necklace. 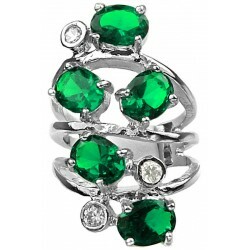 Bold statement emerald green costume jewellery long swirl ring is accent prong-set emerald green oval stones and rub over clear diamantes setting between three circles, swirling and intertwined together to create spiral pattern, integrated into silver plated triple split shank band. 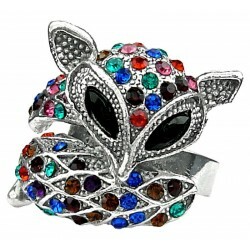 Adorable funny cute animal fox ring presents 3D fun fox motif with curled tail, multi coloured diamantes encrusted head to tail, adorn two black marquise diamante eyes, set on silver plated adjustable ring band. 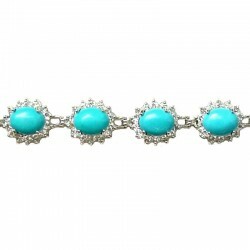 Cluster oval turquoise cabochon stone bracelet is created from nine blue oval turquoise cabochon stones, each surrounded by clear diamantes linked encircle around the wrist. 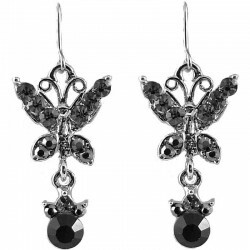 Perfect for adding glamour sparkle to any outfit with these silver plated butterfly drop earrings set with black, haematite and grey diamantes. 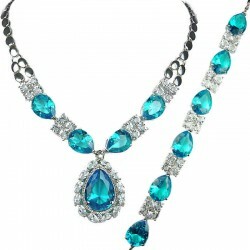 Eye-catching blue costume jewellery set with matching dress necklace and bracelet, features claw setting large facet-cut blue pear-shaped teardrop rhinestones interval linked clear round diamantes. 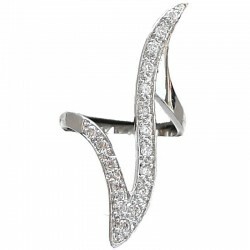 Simiple beauty innovative fashion jewellery design, polished finish of silver plated clear diamante simple wave fashion dress long ring features with simple elegant long curved line, encrusted with clear diamantes to create a high end luxury finish to this trendy fashion long ring. 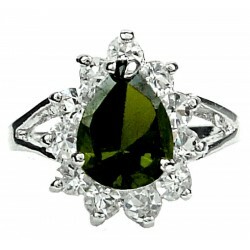 Timeless classic silver plated green pear cut teardrop simulated diamond halo costume ring is set with a green pear-shaped teardrop rhinestone as centre stone, cluster of clear round diamantes. 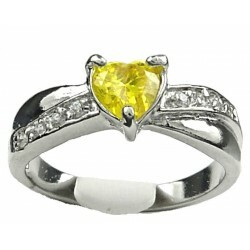 Modern and romantic love heart costume dress ring shimmers yellow heart shaped diamante as centrepiece with a band of clear diamantes and smooth finishing silver plated crossover design. 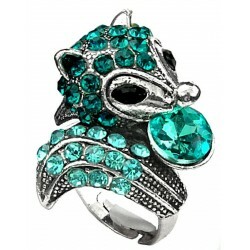 Adorable funny cute animal hedgehog ring presents fun hedgehog 3D motif holding an aqua blue round rhinestone, encrusted head with aqua blue diamantes and blue diamantes in tail, adorn two black marquise diamante eyes, set on silver plated adjustable ring band. 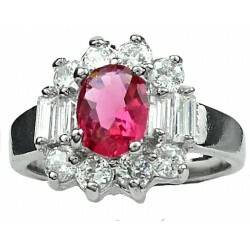 Unique women costume cluster dress ring presents a 4-prong claw set dark pink oval rhinestone, encircle by clear baguette cut and round diamantes to highlighting the central dark pink stone in futuristic jewellery style. 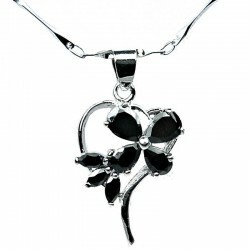 Black CZ butterfly open heart pendant is claw setting with black teardrop cubic zirconia as butterfly perched on flower sparkling at the centre of the rhodium plated elegant open heart shaped pendant, displaced from silver plated twisted chain necklace. 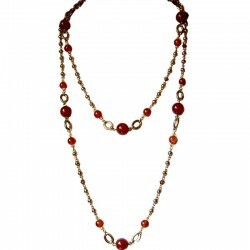 This extra long antique gold plated necklace is fantastically versatile, made from antique gold plated beads, brown beads and Carnelian beads. Simple yet distinctive swirl fashion ring presents six strands of paved peach champagne diamantes surf entwined together to create wave ripple pattern, set into rose gold plated ring band. 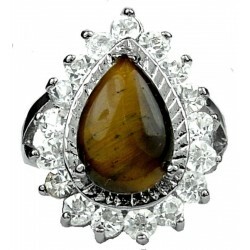 Timeless beauty halo cluster costume dress ring presents a tiger eyes pear shaped rhinestone in claw setting with a halo of smaller clear diamantes around the brown teardrop natural stone, set on silver plated split shank shoulder band. 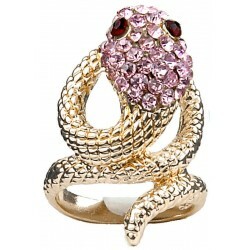 Cool fashion statement coiled snake gold ring presents head to tail coil sinuously at the front, pink diamantes pave the head with two ruby red diamante eyes, the tail swirling a band to encircle the finger, gold plated snake scale finishing follow through the whole ring. 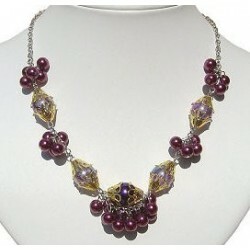 Fuchsia cluster fashion pearl necklace links with fuchsia pearls, fuchsia rainbow beads and gold bead caps in elegant chic, delicate cluster style with silver plated chain. 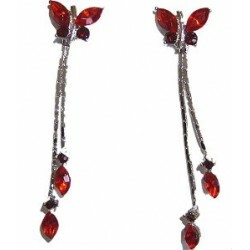 Red diamante butterfly drop earrings feature red teardrop and burgundy diamante butterfly post earring studs, dangling red teardrop and burgundy diamantes. Green rainbow diamante large butterfly rope necklace dangles large butterfly pendant encrusted with different size of reflective green rainbow diamantes, clear and clear rainbow diamantes, dangling on a black silk rope. 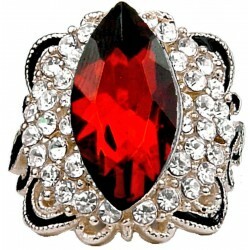 Costume statement gold ring presents a large ruby red marquise-cut rhinestone, enhanced by glittering full halo and cluster of clear diamantes surround the red stone, black enamel wave swirling shoulder down both side, set on gold plated adjustable band. Stretch beaded bracelet uses red rainbow beads and elastic thread, woven grid stitch pattern to form a 4.3cm wide beaded elasticated strap around the wrist, adorned with red rainbow bead waterfall long tassel drops. Burnished brass multi-layer long chain necklace consists of burnish brass plated varying type of chains and a strand of rose gold plated cable chain, cascading among multi row at different length, adorn with copper brown cushion faceted beads. 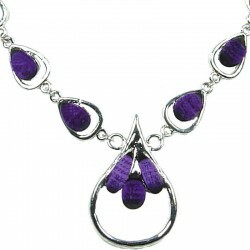 Modern costume jewellery set with matching necklace, bracelet and earrings, features twined on silver plated claw setting clear diamantes, studded at intervals with 2 prong setting purple facet-cut marquise rhinestones in fashion style. Let fun loving fashion with these black plated asymmetrical earrings feature a tick symbol for one ear and a cross symbol for the other, both pave with purple diamantes. 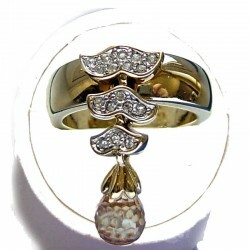 Dangle crystal teardrop cubic zirconia CZ goldtone Dress band ring features with gold plated band ring, adorned and dandling with three diamante wings and a charming soft brown cubic zirconia teardrop crystal. Royal style silver tone red diamante necklace features with a layer of linked red diamante wave, dangling at centre of a ruby teardrop rhinestone embellishment with small red round diamantes. 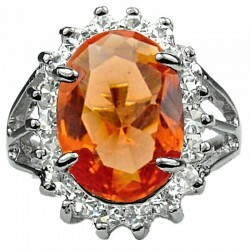 Stunning women halo cluster costume dress ring presents a large orange faceted cut oval rhinestone in 4 prong claw setting with a halo of smaller clear diamantes surround the orange stone, set on silver plated split shank shoulder ring band. 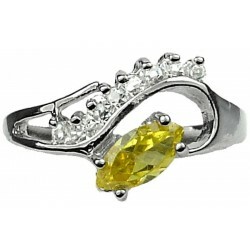 Unique ladies costume silver jewellery dress ring presents a yellow marquise rhinestone twisting a row of clear diamantes wave swirl with a halo, making the yellow marquise stone work beautifully as focus point. 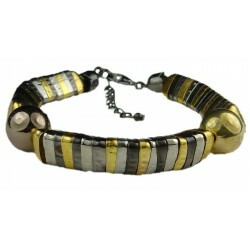 Egyptian style mixed metal stacked beaded snake spine coil bracelet is composed of mixed metal of silver, antique silver and gold plated triangle shaped bead caps, embellished with mixed colour metal beads strung together to form an Egyptian and hip hop style in fluid articulated bracelet. 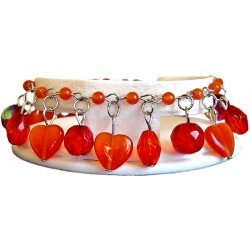 Love and natural are the theme of these silver plated costume jewellery natural stone heart charm drop bead cluster bracelet dangle red cats-eye hearts, embellished with red cats-eye stone beads, red and red rainbow beads, present in gift box as fashion gifts for her, women and girls. 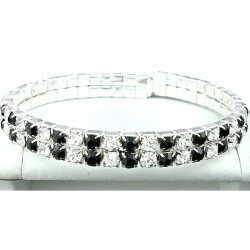 Black & clear diamante open ended bangle bracelet features high-shine silver tone link up two rows of clear and black diamantes, encircle the wrist in open-end style, suit for various monochrome occasion. 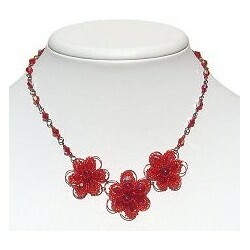 Three beaded red daisy flower necklace features red wire wrapping with different size of red, rain rainbow and burgundy beads to create three beaded flowers as focus point, elegant and sophisticated handmade beaded jewellery. 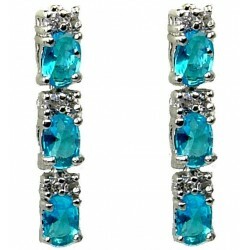 Blue oval crystal CZ short drop earrings feature three set of facet-cut blue oval and clear round cubic zirconia on silver plated claw setting linear linked together, to create simple sweet dainty stylish post drop earrings. Brighten up your outfit with this silver plated purple Iris Cristata fashion flower bracelet features Iris Cristata flower detail at the centre, embellished with purple acrylic rhonestones and clear diamantes. 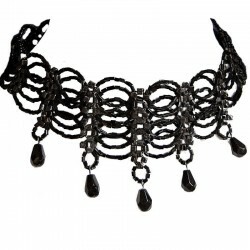 Stunning to wear with evening dresses with the gorgeous ocean wave beaded choker, uses black and charcoal beads, wave stitch pattern, drops with black teardrops, sits perfectly around the neck. Rose gold 2cm huggie hoop earrings feature with anodized rose gold steel in hinged huggie hoop style, smooth polished surface to create classic rose gold electro-plating design unisex costume jewellery intended for men or women. 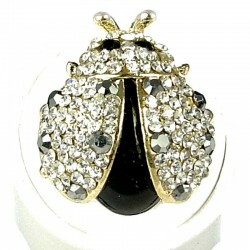 Fabulous gold plated ladybird cute statement ring features large black crystal teardrop body, clear diamante and marcasite wings and black diamante eyes, love to go happily perch and show glamorous on finger. 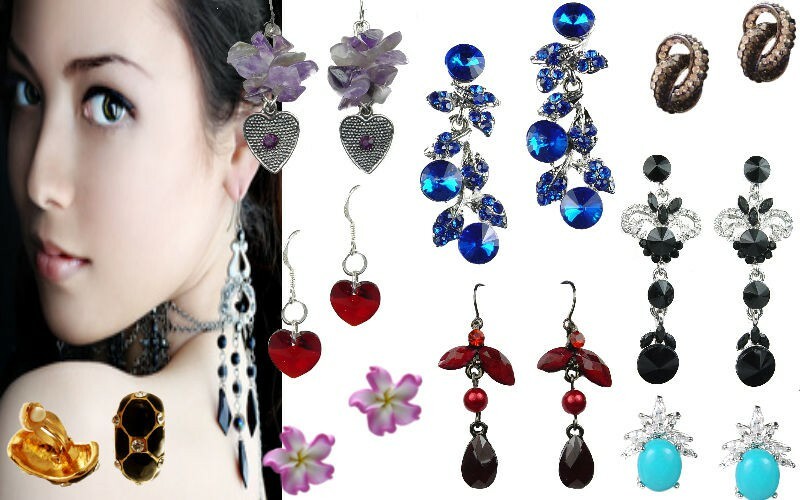 A lot of love and natural inspiration of cute costume jewellery set combines blue natural stone heart dangle bead necklace, bracelet and drop earrings, features blue cats-eye hearts, blue cats eye beads, blue and blue rainbow beads in dangling style, presents in gift box, nice gifts for her, women and girls. Brighten up your outfit with this silver plated burgundy Marigold flower bracelet features Marigold flower detail at the centre, embellished with clear diamantes, burgundy and black acrylic rhinestones. Bling hip hop style monochrome black white diamante angry wave fancy large stud earrings pave with black, haematite, clear and clear rainbow diamantes. Perfect for finishing touch to dressy outfit with this purple rhinestone teardrop silver link dress necklace is embellished green acrylic teardrop rhinestones with silver plated teardrop link. 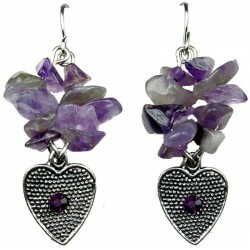 Purple costume jewellery set combines matching teardrop necklace and medium drop earrings, features purple faceted teardrop rhinestones and purple diamantes, presents in gift box, dressy fashion wedding and party dress accessories for women.